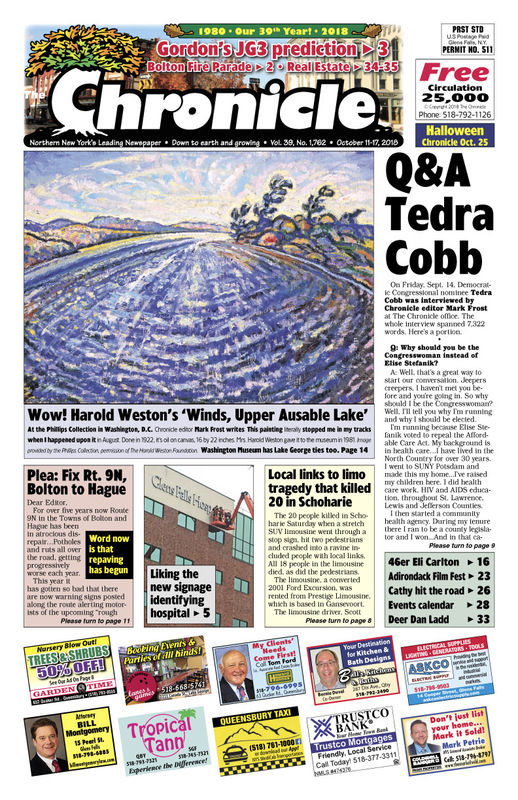 Destination Downtown issue | Tedra Cobb interview, Scoharie limo crash. Bolton Fire Dept. Centennial Parade, BBQ & more, Oct. 13. JG3 announcement Sunday. SGF schools monitoring all in-house emails & social media of HS students. In Washington, D.C. The Phillips Collection is nice museum, with some Adk. links. 3rd Adirondack Film Fest opens Thursday (Oct. 18). Pages of real estate listings… Find your dream home! Concerts, comedy, shows… The Chronicle always has the region’s best Arts & Entertainment section!